The TidesMarine Upper Rudder Bearing-Standard (URB-STD) is designed to be mounted directly on top of the rudder shelf. It is an ABS and Lloyds approved, self-aligning design which accommodates up to 10 degrees of off-axis alignment between the mounting surface (rudder shelf) and the rudder stock. As a result, it requires no shimming during installation and won’t load the rudder shaft during vessel operation. The URB-STD is lighter than conventional bronze units. It consists of a UHMW ball-type bearing captured within a UHMW housing. The ball-type bearing is designed with shoulder at the top to accept a rudder collar, allowing the unit to effectively carry rudder "download" during vessel operation. The Tides design eliminates metal-to-metal contact and the associated problems of abrasion and electrolytic corrosion. The URB-STD is self-lubricating and maintenance free. Steering is smoother and quieter. 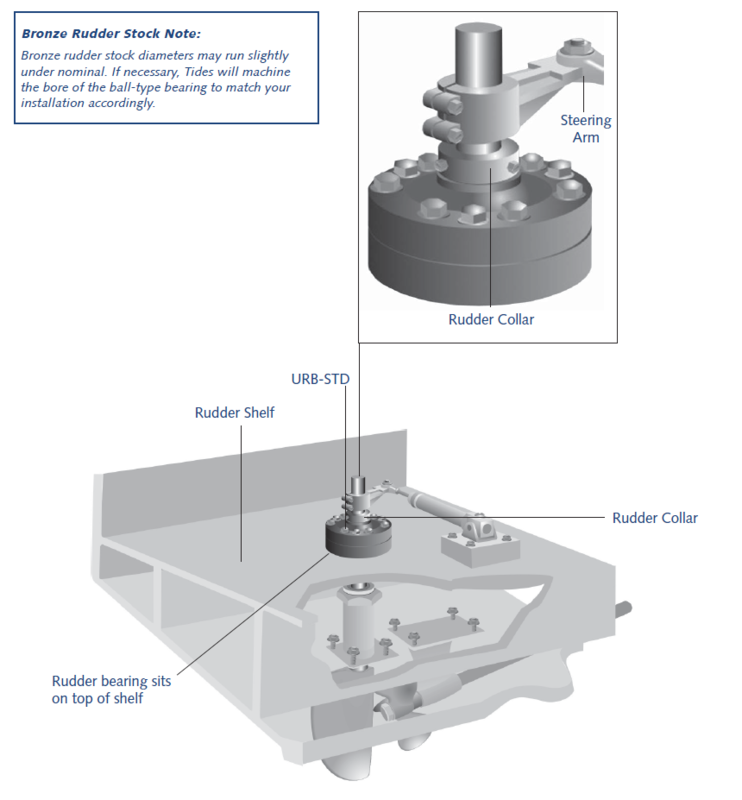 Minor mounting adjustments to the rudder system’s steering components may be necessary if the height of the unit is different than the metal pillowblock style bearing it is replacing. Upper Rudder Bearings Standard may be ordered online.